New year. New slate. I know some people aren’t into resolutions, but I like the chance to step back, reassess, and commit myself on new paths. 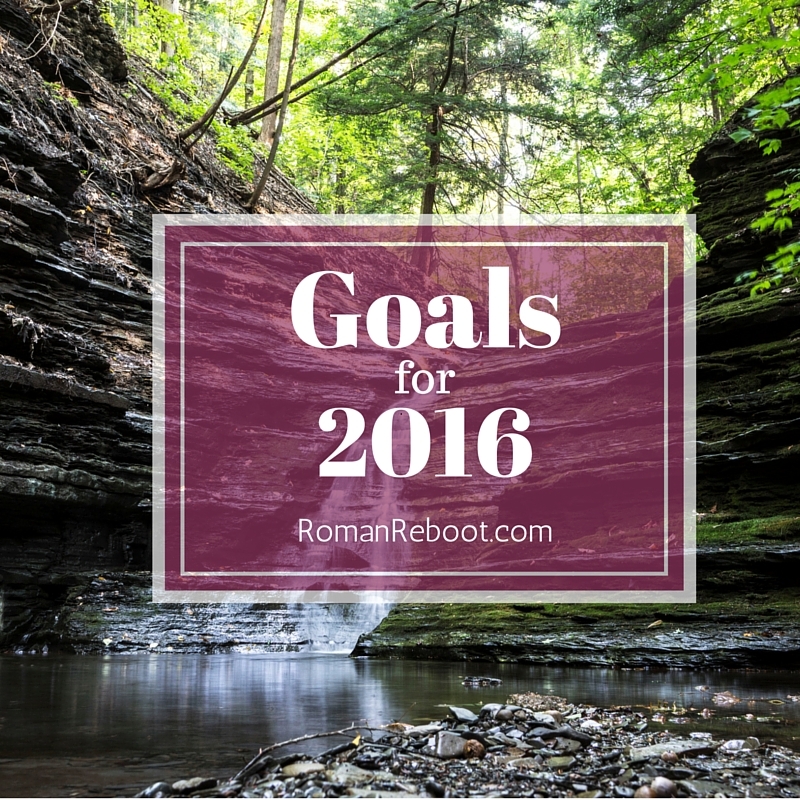 I still need to do some wrap ups on 2015 (I actually hit some of last year’s goals! ), but since we’re already (almost a month!) into 2016, might as well start there. I’ve toyed with doing a different format for the resolutions/goals/whatever you want to call them. For example, LVK does quarterly goals. I like the idea of this, but, as always, I find it hard to think ahead to what future me wants. And with the brand-spankin-shiny new year, I find myself wanting to start on everything at once. I know some people just think of an intention for the year. Such as a one word focus. A theme for the year, if you will. I’ve thought about this, and my word for this year is HEALTH. Yes, I’d like to look better, but this year it is all about feeling better. I’ve decided that I have too many things I want to do. I don’t want to waste any time feeling crappy. I do have a few specific things in mind on the health challenge. I know this makes me feel better. I know it. But it does take a little more work in terms of advance planning. I’ve been straddling the line of 80/20ish. Still eating whatever in restaurants. Still baking occasional treats. Still letting the kids eat more crap. This might be the year I finally cut the cord. I don’t want to be known as somebody who is annoying to eat around. I don’t want my kids to feel so deprived that they cram candy whenever they get the chance. It will have to be a gentle approach. But I just might do it. As a part of health, (emotional health?) I’d like to strengthen relationships, particularly with people back in the States. I have an amazing community in Rome, and things are going well there. (Although I could always do more.) I would like to focus on other friends as well though. And can’t forget the families! I have some thoughts. Probably some dedicated email time on the calendar. Also . . .
I’d like to get into the habit of sending semi-regular group emails to our families. Just little updates with what we are up to. If they have a chance to respond occasionally, great. Worst case scenario, it will be more like journaling. Have I sent one yet this year? Uh, no. But I’m working on it! For a long time, I’ve toyed with the idea of putting together a list of all my friends and then trying to cycle through the list with the goal of contacting more people. I’ve never done it. One, this seems like a lot of work. Two, it somehow feels kind of callous. I don’t know. Like some kind of weird friend categorizing. This holiday season, however, I realized that I ALREADY have such a list. Specifically, the Christmas card list. And best of all, this list already has addresses. My plan is to print the list and slip it into the car. That way it will be good to go whenever I get around to buying postcards on our weekend adventures. If you don’t receive a postcard, please don’t take offense. This is pretty much a harebrained scheme anyway. Right now I currently get decent solo time with Mac when Henry is at school. Henry, though, not so much. And James doesn’t usually get solo time with either. It can just be hard. After a full day of kids, one of the last things I want to do is to cut into “my time” to do something with a kid. And the weekends are supposed to be family time! We can’t split up then! Well, we can, and we will. Or at least we will try to. I’m also going to try for some situations where Mac has some kind of childcare so I can hang with Henry. On improving the relationship with Little Mister, I also have a few thoughts. With our current regime, James cleans up the kitchen after the kids got to bed 95% of the time. I don’t hate the current system. I don’t have to clean up, and I get to spend a few minutes left to my own devices. I probably should go talk to James while he cleans, but then I would probably feel guilty like I should pitch in or something so I usually don’t. This worked for a bit, but I think it is time for a change. First off, in my mind, the kids go to bed at 8:00 pm. This is probably the case less than 15% of the time. Bedtime keeps creeping later and later. So maybe they go to bed by 8:30ish. But then maybe the kitchen isn’t done until 9:00ish. Which really puts a crimp in adult time, particularly if one of the adults is kinda sorta avoiding the other one. Also, the situation has changed. It used to be that the kids (or at least some of the kids) needed someone there all the time. Now? I’m not worried about eyeballs on them all the time. Also also, the kids can be more helpful. They help me in the kitchen throughout the day, but it definitely would not hurt to up the message that we all pitch in after meals. And if they wander away during cleanup, it isn’t the end of the world. Which should free up some more adult time. Which brings me to my next point . . . Most days, 8:30 – 10:00 pm is a mixture of getting ready for bed, trying to convince Henry to stay in his bed, getting stuff done on the internet and then BLINK it is time for bed. Sometimes we watch TV. But most days, I wouldn’t look back and say, wow, that was an excellent, restful use of my evening. I want designated TV nights, designated internet nights, designated read nights, designated sit and stare at each other soulfully nights. It is all happening. Not everything has to be an amazing. But it must be a deliberate choice. No more evenings frittered away. Maybe some of that deliberate evening time will be used for travel planning. This is a big one for me this year. We’ve gotten better on day trips. We’ve even gotten better on weekend overnights. But ask me to plan something that involves flights, trains, and multiple hotels and I fall apart. This year I want to better. Much better. I’m aiming for at least four week-long vacations to locales on our list. Hmm, if I was aiming for quarterly goals, I think I’d try for something like this. Designate vacations for the year and book as much as possible. Read or eliminate all those rando books on the bookshelf. If not already done, go through all of that random stuff piled around the bedroom. Print Mac’s picture for the photo wall. Uh, I don’t know. That seems really far away. Hopefully Q3 Melissa can come up with something. That’s where I’m at. You’ll notice I have proclaimed no blogging or writing goals this year. So we’ll see how that goes. How’s your 2016? Did you set resolutions? An intention? Quarterly goals? How are they going so far?